WATERLOO – Wilfrid Laurier University is proud to join the Council of Ontario Universities (COU) in a campaign to support Aboriginal learners and encourage Aboriginal youth to pursue education at the university level. The “Let’s Take Our Future Further campaign,” which was unveiled this week by the COU on behalf of the province’s publicly funded universities, aims to celebrate the achievements of Aboriginal learners currently studying at Ontario universities, along with Aboriginal university graduates, who make a daily difference in their communities. As part of the Let’s Take Our Future Further campaign, COU has launched futurefurther.ca, featuring compelling profiles and videos from 13 role models who are studying at, or have recently graduated from, an Ontario university. Two Laurier students are featured in the video profiles. Laurier is committed to building capacity in Aboriginal education and has established an advanced model for Aboriginal student support. This includes an Aboriginal Education Council, a senior advisor for Aboriginal initiatives, student-support staff, Aboriginal Student Centres on both the Waterloo and Brantford campuses, and program-based elders. Laurier also offers Indigenous academic programming, including a Master of Social Work Aboriginal Field of Study, and a Bachelor of Arts in Indigenous Studies. Laurier’s commitment to supporting Aboriginal learners is established in the university’s new Strategic Academic Plan and in its Strategic Mandate Agreement with the Ontario government. “We tend to focus on the disparity in educational attainment for Aboriginal people and forget that we have made significant strides over the past four decades,” said Jean Becker, Laurier’s senior advisor for Aboriginal initiatives. “With 6,500 postsecondary Aboriginal students currently in Ontario universities, and many thousands more alumni, we all have role models and success stories to share." As part of the COU’s Let’s Take Our Future Further campaign, resource kits for Aboriginal learners transitioning into or considering attending an Ontario university will be distributed widely. Next week, an online video contest will launch on Twitter and Facebook asking Aboriginal learners currently enrolled in university to tell their story about how university education has taken their future further, and has also enriched the future of their communities. The COU campaign comes just months after a report by the Truth and Reconciliation Commission which put a spotlight on the need to ensure equitable access to postsecondary education for Aboriginal students. November also marks the anniversary of the Report of the Royal Commission on Aboriginal Peoples which highlighted the many benefits of education and the huge costs to individuals and communities if these opportunities are missed. According to Statistics Canada, seven per cent of Canada’s self-identified Aboriginal population over 15 had a university degree or certificate compared with 21 per cent of Canada’s non-Aboriginal population. In Ontario, nine per cent of Ontario’s self-identified Aboriginal population in that age group had a university degree or certificate compared to 23 per cent of Ontario’s non-Aboriginal population. The same Statistics Canada survey indicates that Aboriginal youth between 15 and 24 represent 18 per cent of the total Aboriginal population in Canada, with a further 28 per cent being children aged 14 and under. This means that a significant number of Aboriginal youth will be contributing to Canada’s economic and social prosperity by 2026. 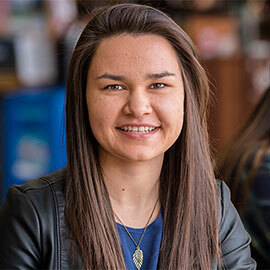 The Let’s Take Our Future Further campaign supports efforts at Laurier and other Ontario universities to engage more Aboriginal learners in the postsecondary programs critical to those future contributions. Follow on Twitter at @futurefurther, YouTube at Future Further, Instagram at @Future.Further, and Facebook at FutureFurther.